What has the company said about job losses? The discussions over jobs are at an early stage and the company will try and avoid job losses by filling internal vacancies with existing staff, including roles at other bases, Flybe's chief executive Christine Ourmieres-Widener told BBC Radio 5 live. The company is "engaging with all impacted crew", she said. Of the delays, she said the company would "follow all the rules of compensation" and that "we are expecting to go back to normal operation as soon as possible". While the disruption was widespread, it only affected 5% of flights, she insisted. "Flybe's plan to restructure and reduce its jet operations across many bases is part of the company's long-standing objective to stabilise the business," she said. The cuts will affect Doncaster, Norwich and Exeter, as well as Cardiff, as the company seeks to drop expensive jets in favour of cheaper turboprop airliners. 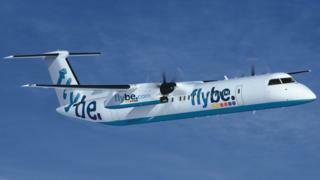 Exeter - Flybe will fly its last jets from the airport on 26 October. This will not affect turboprop flights or its "base structure" it said. Norwich - Jets will also stop flying from this airport at around the same time. This will not affect services at Norwich operated by Flybe's franchise partner, Eastern Airways, it said. Cardiff and Doncaster - Flybe will also stop flying jets from these two airports. It will close its servicing operations at the airports, but will offer turboprop flights. Unite the union regional officer Peter Coulson said: "Unite is seeking to minimise the potential job losses and secure assurances about Flybe's long-term future." He urged the company to be forthcoming about its plan. "It is essential that Flybe is fully transparent with its workforce about the exact situation facing the company. The current uncertainty is incredibly unsettling and is in danger of severely damaging morale at the company." "We received a curt email at 19:00 last night followed by an even shorter text message," she said. "No other flight options were offered." "Our holiday is totally off now, and I hope my insurance company can help me," she said, describing herself as "very annoyed today". Anyone whose flight is cancelled is entitled to choose between a refund paid within seven days, or an alternative flight (or bus) - even with a rival carrier. The 18:40 service from Newquay to Heathrow could not take off on Sunday because of a "technical issue". Connect Airways, a consortium led by Richard Branson's Virgin Atlantic, paid a total of £2.8m for Flybe's assets and operations. How has the company ended up in this situation? This January, one employee was moved to send an email accusing the firm's directors of ruining a profitable company. The employee, a senior pilot, addressed the email to Flybe's chief executive, Ms Ourmieres-Widener. "Congratulations, in two years at Flybe you and your fellow incompetent cohorts have managed to totally destroy a viable airline which was making profits when you took over," he wrote. Flybe told the BBC that "an individual was suspended on 17 January 2019 in accordance with company policy".